Love brownies but can't be trusted around an entire pan of ‘em? You'll flip over these new portion-controlled chocolate treats. In Cookie Dough and Triple Chocolate, the Supreme Brownies are supremely decadent! We also love the cute little Brownie Bites packs, in Chocolate Fudge and Chocolate Caramel. Available nationwide. 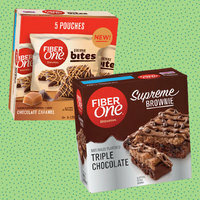 Also be on the lookout for Fiber One's Limited Edition Birthday Cake Bar... just 90 calories! Lupini beans were apparently a fuel-up favorite of Roman warriors, and with good reason: They're said to be the most protein-dense plant on the planet. (They're fiber packed, too!) 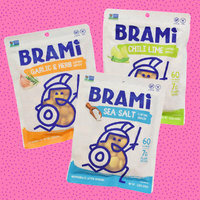 These refrigerated snacks come in five flavors: Sea Salt, Balsamic & Herb, Garlic & Herb, Chili Lime, and Hot Pepper. All are “lightly pickled" but taste pretty pickle-ish to us! Great over salad or as a straight-up snack. Click to locate, or order online! 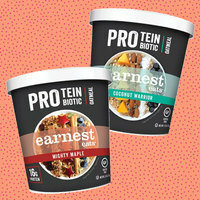 In Case You Missed It: New Products Revealed on Facebook Live! Watch Lisa try brand-new products that arrive at Hungryland! It’s an unboxing reveal party with tons of new finds. Check out the latest Facebook Live video, and stay tuned to the Hungry Girl Facebook page for more! Time-and-mess-saver alert! How often does the prep work of a multi-veg salad prevent you from enjoying a healthy bowl of chopped produce? Not any more! 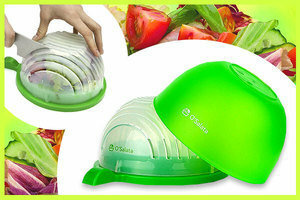 With this creative gadget, you can rinse and chop a variety of veggies in one convenient container. We love a good multitasker! We tried it, and it ROCKS. Bonus: It's great for fruit salad too! Definitely worth picking up. And that’s all we’ve got. ‘Til next time... Chew the right thing! Today, February 5th, is National Chocolate Fondue Day. Forget molten hot goo, and dunk fresh fruit in this cool and creamy Double Chocolate Cheesecake Dip! Give your pal's diet some extra power -- click “Send to a Friend” now!